REDDING, Calif. - Esther Wofford and Bekah (Wofford ’12) Eppler are the first set of sisters to earn All-American basketball honors under the leadership of Simpson University head women’s basketball coach Derrick Pringle Jr.
Wofford earned National Christian Athletic Association (NCCAA) All-American honorable mention honors at the end of the 2014-2015 season. Eppler earned NCCAA and National Association of Intercollegiate Athletics (NAIA) All-American honors when she played for the Red Hawks during the 2011-2012 season. Wofford is a business major who plans to graduate in the spring of 2017 and pursue a career in coaching. Eppler graduated in 2012 with a B.A. in communication with emphases in organizational leadership and public relations. She is a stay-at-home mother who plans to return to coaching basketball after the birth of her second child in October. 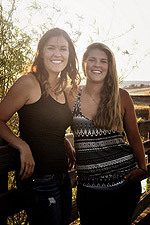 The sisters have a long history of playing basketball, both starting their careers at a young age. Even though they are eight years apart in age and never had the opportunity to play on the same team, they have a bond that was strengthened by having a love of basketball in common. 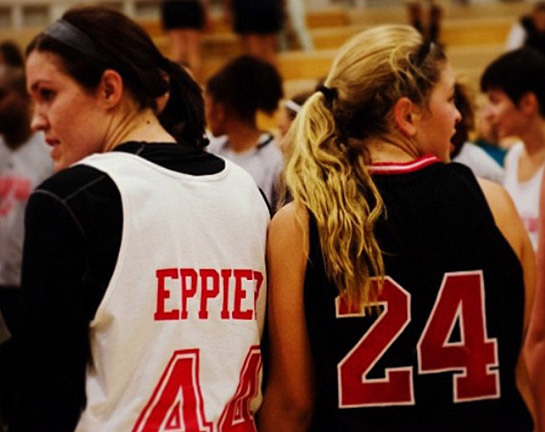 “Basketball gives Esther and I the chance to spend more time together and to connect on another level than just being sisters,” Eppler said. They also share a competitive spirit. During their playing careers, Wofford and Eppler have had the support of their large family, which lives in Encinitas, Calif. In addition to their All-American honors, Wofford and Eppler have received other basketball awards. Wofford was selected as the California Pacific Conference (Cal Pac) Defender of the Year and was named to the All-Cal Pac and NCCAA West Region first teams in 2015. Eppler was named Cal Pac Freshman of the Year in 2011 and earned first team All-Cal Pac honors in 2011 and 2012. She also helped the Red Hawks finish second in the Cal Pac in back-to-back seasons, which was a first in program history. Photo Top: Bekah Eppler (right) and Esther Wofford (left) play against each other in Simpson’s 2013 women’s basketball alumni game. Photo Bottom: Bekah Eppler (right) and Esther Wofford (left) pose for a photo.